This part of the Russian River watershed encompasses Bennett Valley east of Santa Rosa and agricultural lands around Cotati, Rohnert Park, Windsor, and Santa Rosa. This area includes both flat and hillside lands and often includes rural residents near to vineyards. Tributary creeks in this area include: Matanzas, Santa Rosa, Upper Mark West, Windsor, Poole, Copeland, Crane, Colgan, Hinebaugh, Spring, and Paulin creeks. This 238-acre site has been farmed in orchards and vineyards for over 70 years. The current owner is pursuing organic certification. Owner John Balletto and his family protected the valley oaks on this site when the land was planted in vegetables; as the land has gradually been converted to winegrape growing both soil and water conservation have increased greatly. This family farm of 12 acres includes "old" vine zinfandel planted in the late 1800s and farmed by the Arata family from 1906. The Chelli family purchased the vineyard in 1976 and manages the site with cover crops and low-chemical usage. This site in the Windsor Creek watershed uses cover crops to protect soil. DeLoach vineyards are certified organic and are converting to biodynamic farming practices. 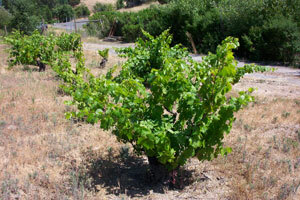 This site borders Matanzas Creek and only half of the property is farmed for winegrapes. This 20-acre site includes additional soil conservation measures to protect water quality. This farm, owned by the Judge Family, includes 9.5 acres of vineyard. 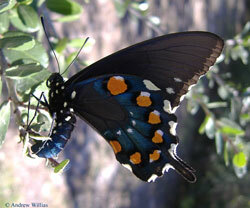 Several seasonal creeks that feed into Matanzas Creek, a tributary of the Russian River, are protected as open space. This 42-acre site covers rolling hills separated by several ephemeral creeks in the Windsor Creek watershed. Vineyard managers Scott Bauer uses soil conservation practices to protect water quality in the creeks. 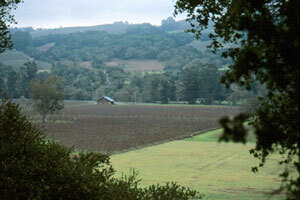 This 60-acre site borders Mark West Creek and is owned by the Laughlin family, early pioneers in Sonoma County. 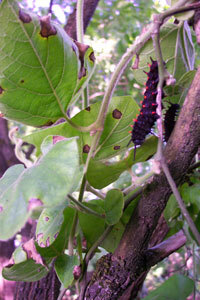 The riparian corridor along Mark West Creek is diverse and supports pipevine swallowtail butterflies as well as the lone redwood after which the ranch is named. This family vineyard is 5 acres in size and has a home winery. The owner manages the site to protect soil and the adjacent seasonal creek. The vineyards on these two sites are managed with the environment in mind. Soil is protected with cover crops to improve water quality. The riparian corridor of Windsor Creek is planted with native plant species once invasive non-native species are removed. 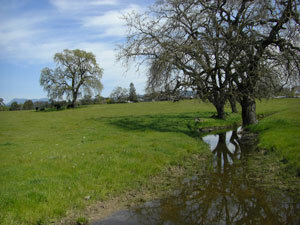 This site in the Matanzas Creek watershed protected creeks and springs when the vineyard was developed.